The Korean War Veterans Memorial in DC remembers the more than 5 million lives lost, in what is sometimes remembered as "The Forgotten War". In reality, the Korean War marked the unforgettably vicious beginning to the Cold War and the Western fight against the forces of communism. 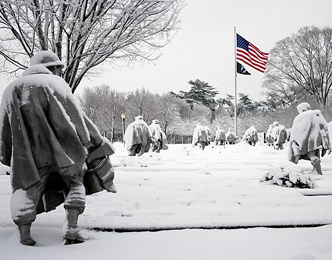 Visit the Korean War Memorial and see the 19 larger than life soldiers on patrol. Learn about the significance of the 38th parallel and pay tribute to those who served in the trenches of what many consider to be the line between communism and democracy. Hear the history behind the war and its memorial on our National Mall Tour.